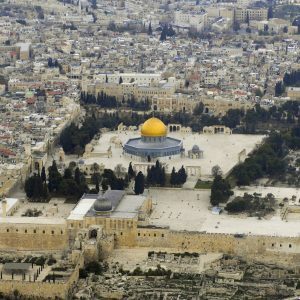 As violence continues in Jerusalem and elsewhere in Israel/Palestine as a result of a dispute over access to the Temple Mount/Haram al-Sharif (also known as Haram esh-Sharif), the Pope has appealed for moderation and dialogue over the future of the site that is sacred to both Muslims and Jews. Speaking to those gathered in St Peter’s Square on Sunday for the Angelus prayer, the Pope said he was following the events in Jerusalem “with trepidation”. Last week two Israeli policemen were killed by Arab gunmen firing from the Haram esh-Sharif complex, and in response the Israeli government erected walk-through metal detectors at all entrances to the site. Arabs have viewed this as an attempt by the Israeli state to further exercise control over this part of East Jerusalem, which before 1967 was predominantly Muslim but which now has an almost entirely Jewish population. In response to the security initiative, Muslims have refused to pass through the metal detectors and have been holding their prayers in the streets surrounding the sacred site. This has led to increased tensions between Arabs and Israelis and violence that has seen six people killed. The Temple Mount is sacred to Jews because it is here that Solomon, son of King David, built the First Temple in 957 BC. It was destroyed by the Babylonians in 586 BC, but a second temple was built here in 516 BC. However, this was destroyed by the Romans in AD 70. According to Jewish tradition, it is here that the third and final Temple will be built – it is the holiest site in Judaism and all Jews face towards the Temple Mount when they pray, no matter where they are in the world. Among Sunni Muslims, the location is known as ‘the noble sanctuary’, Haram esh-Sharif, and it is their third holiest site after Mecca and Medina – it is believed that it was from here that the Prophet Mohammed ascended into heaven in AD 621. The Dome of the Rock, which was built in AD 692 over the spot where the prophet last stood on earth, is one of the oldest Islamic structures in the world.